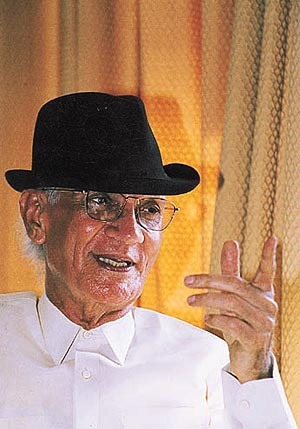 Today 28th January marks the first death anniversary of maestro par excellence O P Nayyar. I had written a post on OPN on April 16th 2006 whilst he was yet amongst us but in response to a news item which detailed how O P ji was living with an adopted family. One knows now that the family in question accorded him all the love and respect they could possibly summon. At the time however, to imagine a ‘Badshah’ of Music directors and especially someone who had lived life on his own terms, royally, in such dire straits, evoked a surge of emotion. Thus the post ‘O P Nayyar- Not Forgotten” was born which has since accumulated staggering statistics of 20,000+ views and 1,000 + comments and growing. Perhaps the highest in the Desi blogosphere. This if anything is a reflection of the magic of OPN’s melodies and the ardent love of his fans from all over the world. Timelessness if a factor to evaluate talent, OPN wins hands down. Of the hundreds who commented..Famed music composer from Pakistan, Sohail Rana, one of his ghazals being the unforgettable ‘mujhe tum nazar se gira to rahey ho, mijhe tum kabhi bhi bhula na sakogey’ , visited the blog and speaks of the last call to O.P. Nayyar just a month ago..he pays an emotional tribute to him in the comment section of the post. His adopted daughter Ashwini Karandikar too speaks, in the comment section . Ashraft through his comment has informed us of his passion for O.P.Nayyar’s music and that he has laboriously collected every single song composed by the maestro. Incredible! True passion and grit which needs to be lauded. Priceless treasure is now his! Siraj Khan who has been writing the biography of O.P.Nayyar Saheb, exclusive rights for which had been granted to him by the maestro, had commented on this post last year as well.. Please read his tribute and of his plans for the book, from which he has been kind enough to write here of amazing incidents and trivia associated with Nayyar Sahebs songs.. information which could not have been gleaned from any other source..
Abed has graciously and magnanimously offered to send cd’s of his collection of Nayyar Sahebs songs to anyone, anywhere. Hemant, who had the good fortune to attend his recordings and experience the wizard at work, provides us with remarkable insights into the maestros recording techniques and his enigmatic personality. We have been afforded glimpses into his personal life and times, some touching, some controversial. Today, a talk with Tushar Bhatia the music director of ‘Andaz Apna Apna ” apart from being a passionate O P fan revealed the appalling ways of the world. Apparently, besides Tushar and O P jis adopted family consisting of Ashwini karandikar and Rani Nakhwa, nobody from the film industry thought it fit to even attend his last rites. Tushar holds dear the mementos and memories he shared with OPN in the last years..while we hold on to his melodies as fresh and invigorating a ever. As a symbol of commemoration, we Sachnitians ( as one of my readers coined it) decided to create a Op Nayyar Top 25 list based on a consensus among all . It was difficult since one cannot really sift out gems, when each is as if precious and rare. However, its been done with earnestness and goes as follows. Koi batla'aye kay hum batla'aiN kya? Yeh sub kis kay liyay? Are you happy -- really?